I do not know when it began, but you do. It began with a discontent, a gnawing in the soul, an out-of-placeness. It began with heresy. Or perhaps it began with an expansiveness that drove you to seek, to inquire. It began with thoughtful inquiry. And it wasn’t an intrusion, it was a kindness, a courtesy, and you found your way home. No – I know you – you grew up in the church. Your parents, or grandparents, or great grandparents trusted this faith with what they held most dear in the world: the hearts, the minds, the very souls of the next generation. 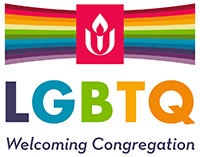 During all your explorations, Unitarian Universalism was your church home, and your sense of belonging has deepened throughout your life. Nope. You searched on the web, you answered a survey on belief.net. You entered some magic combination of words, clicked the I Feel Lucky button, and Googled your way to this saving faith. I do not know when it began, but you do. Remember your beginning and bring hold it within you for our time together this morning. It is time to celebrate. We gather this morning in celebration of 50 years of religion woven from many strands, inscribed in the gospel of universal salvation, tradition that proclaims the good news that every single person has inherent worth. Every individual has worth and every individual can have a personal and direct relationship with the divine, not because they learn the “right prayer” or enact the “right ritual”, or make the “right confession” but simply because they because they have a heart that beats, lungs that draw air, eyes that see, ears that hear, lips that can give witness – each person has worth and dignity simply because they are. Each human life connects, somehow, with yours and mine. We know this. Sometimes we doubt, for a moment, or a year, or a decade and a half, but still we know this. There is an entire world of people outside this sanctuary. We could not ever hope to meet them all, and yet, we know in our bones that each person in that world has dignity, each person has worth. For us, it is a matter of faith. We know that each person gathered inside this sanctuary is also worthy. I know – somehow, it gets harder to affirm inside the hall: He took too long getting ready, she didn’t print the directions, he gave me a hard time yesterday, and I still haven’t forgotten that comment she made at a congregational meeting in 1996. The folks we know best are sometimes the hardest to love well. I get up some mornings, and look in the mirror, and if there’s an argument against inherent worth, I’m sure I’m looking at her. Do you have days like that? You may not know that you are worthy, and I may not know that I am worthy. And yet we are. Every person in this room is a unique and wonderful blessing in the world. So let’s go show them. Please take a moment and greet your neighbors as the unique and wonderful blessings that they are. Friends, we gather to celebrate a free faith that declares that every child, every youth, every woman, every man, can be saved not just once, but again and again and again. Salvation is ever present, universal and ubiquitous. We are all saved. Even me. Even you. We gather this morning to worship, to open our hearts to wonder – to the feel of your child’s hand in yours, that look in the eye of the person you just greeted, to a memory summoned forth by a piece of music, to the feeling in our body as we sing and sway. We open our hearts so that something precious, something Holy can enter. We might call this connection, or community, or God, or Holy Spirit, or Love, but that doesn’t matter. It is here because it is invited, because we dared to create a welcoming space. We gather to celebrate a lived faith, an embodied faith, a faith that declares a ministry for each and every one of us, every woman, man, youth, and child. We are all called, called to wake up, summoned to the life religious and none of us, not one of us, can afford to walk through life sound asleep. All of us all called to ministry. For some, answering that call means a life poured out in service in our Unitarian Universalist ministry. In your 50 years you have largely been lay led, and a number of nearby clergy have provided sermons and services for this congregation. Now you’re blessed to partner the power of that leadership with the Rev. Peter Connolly – a new thing still, and congratulations to you for daring to do something you have never done before. Peter and the other clergy who have been with you for a Sunday or a weekend – none of these folks have been ministers simply because they chose to be. They are not in it for the money, either, although it’s best if you pay them something. No, ministry chooses people for religious leadership, a call so resonant it cannot be silenced…so strident it cannot be denied. A call that came to pound on the door and kept pounding until they answered. I am deeply grateful for our professional clergy, fine women and men, called to minister to us in times of joy and times of sorrow, to comfort us when comfort is called for, to help us make sense of the unevenness, the tragedies of life, to never fail to be touched by human frailty and loss, to work very personally but always on behalf of what we all hold holy, to bend our world toward justice. But ministry is so much more, for if ministers only comfort, then we become a comfortable people. If ministers only reassure, then we are so easily rocked, so easily gentled into complacent sleep. We all need to wake up, for if ministers could do all the work needed to build the better world we proclaim, why, then, do you and I even have hearts and hands? There is a ministry for each of us. You know this is true, because you have practiced lay ministry for 50 years. Fifty-one years ago, a group of Bowling Green folks gathered to discuss a religious possibility. If we could magically peer back through time and watch them sitting around that kitchen table, we would see that they looked more or less like you, and had many of the same motives and passions. They wanted a church with programs for youth and adults and children, a place where they could bring their whole selves and learn, in community, how to live with integrity in the world. Within a year, there were dozens of people, and the Bowling Green faithful joined the Unitarian Universalist Association. Your church was born just after the end of the Korean War, a time of prosperity for many, but the beginning of a new kind of unrest in this country. Some early members of this congregation were war weary, recently returned from Korea or Europe and the Pacifica decade earlier. As you were adding members and opening your hearts to the new adults and children coming here, Martin Luther King, Jr. was crossing a bridge in Selma, Alabama. Our country was becoming increasingly engaged in a southeast Asia policy that would consume far too many of our young men, a war, some would say, whose only wins were buried in the bottom lines of defense contractors. And during all those years and in all the years since, the Bowling Green congregation has been a beacon of hope for the Bowling Green area and a good neighbor for other congregations in Kentucky, the Heartland district and beyond. Over a thousand members have joined that endeavor during the fifty years since. Feel them here with you, the generations of this church. They lived Unitarian Universalism in their workplaces, their homes, in their volunteer lives. Feel the impact of thousands of people, of fifty years of making a difference in people’s lives and the lives of the community. This congregation has made the Bowling Green area more accepting, more tolerant, more compassionate, more caring. Here we are, in yet another difficult time to be socially progressive, to be religiously liberal. I don’t need to tell you this. I think religious liberals were caught like a deer in the headlights when we first came up against an organized effort to repeal the entire 20th century, to return to a time when environmental destruction was merely a cost of doing business, when women’s rights were an afterthought, when children routinely lived in poverty, when racial difference was used to divide and punish, when countries waged war on little or no pretext. The last few years have been a time of political arrogance and divisiveness not seen in this country since the War of Northern Aggression. In the meantime, human rights and civil liberties are degraded even more, our environment hovers on the edge of disaster, and the subways and tunnels of New York City are underwater. Hard times. But when times are hard, remember – you are not alone. Feel those thousand members and friends, standing here with you. Feel them beside you as you work to bend the world toward justice. There is so much to be done. You know that. You’ve been doing the hard work for fifty years. And now, feel a thousand other UU congregations reaching out to you this morning. Feel their thousands, the thousands of thousands. They are here with you this morning, and every morning. And do yourselves a favor – in June the annual UU family reunion is coming to Louisville, just up the road. All of your cousins are coming and seeing them together is much like a miracle, and will make it easier to see them here when you gather each Sunday morning. This is your religious family reunion next June, and I hope to see at least three dozen people from this congregation in Louisville. Earlier we sang the hymn For All That is Our Life; it’s one of my favorites. I know all the words by heart, and the great story of how this ended up in our hymnal. I think of the second verse of the hymn as the hymn for the overcommitted. It reminds us that gifts given and received are the same in some essential way…that we must be able to receive as well as give to have balance in our lives…and that hours of rest and love should follow close on the heels of work and that we should separate the two to create at least some s mall space every day or every week where we rest and renew apart from the cares of our work, even of our volunteer work. For All That Is Our Life is a quintessential Unitarian Universalist hymn. Is there suffering in the world, in our lives? Is there fear and trepidation? You bet there is. We encountered those fearful hours in the middle of verse three. And yet, unlike some other religions, we do not believe that fear and suffering are noble in and of themselves, that we will be or have been saved through suffering – ours, or someone else’s. We suffer, but we know we were not created to suffer. We’re afraid, but we know we were not created to live in fear. You and I were created to make creation itself a less fearful place, to ease suffering wherever we encounter it. We are here to work, to reconstitute the broken pieces of creation into a more just, more compassionate, less scary and more inclusive world. So I like the message, the theology of this third verse, too. But it is the simple first verse repeated again at the end of the hymn that catches my heart. We sing our thanks and praise…. because as my friend the Reverend Burton Carley surely noted in this morning’s service at First Unitarian Church in Memphis, we did nothing to deserve this day. We did not earn it, we did not create it. But we can choose to be grateful within it, to live our lives in thanks, praise, and service. We can choose to build the common good, to serve justice, to show mercy, to live epic lives of service, exemplary lives of compassion. And if our own days are brightened as a result, well, that’s not an accident. The gladness keeps us in the game, keeps us coming back for more day after day, year after year. That’s how it’s worked for fifty years: with gladness. You know that because you have been here. Each of us has a ministry, our own piece of the world to make whole. All our ministries are worthy. The world is in desperate needs of every ministry that embodies our values, every ministry that adds love and compassion to an apathetic, dispassionate world. Perhaps you worry that you are not sufficient to the ministry you are being called to. Do not worry – you will be. You and I do not need to be extraordinary people – just ordinary people with an extraordinary faith. Communities that invite us to pull up a chair or a piece of carpet, or sit around a dinner table, or huddle in front of a campfire and tell our stories, share our lives, so that we remember that we are immersed together in the human condition, remember that this side of fear, we can find no rational basis to deny connection to each other, the many others, sisters, brothers, sons, daughters all. What is most precious is not how much we’ve learned from books, or how smart or articulate we are. Not our oh-so-rational political positions, or the words we craft to impress an audience, or the statements of misdirection we utter so no one will know how sometimes we feel so uprooted, so disconnected, that late at night when everyone else is asleep we cry and can’t even name why. No, not posturing, not misdirection. There is an ancient voice that knows your name and it calls you to a far larger purpose. True stories come from the same place as the words that you whisper into the night air when you sit all alone, under a star filled sky. True stories are stories spoken directly from the heart. that I only realize I am weeping when I brush the wetness from my face. as I share the deepest yearnings of my soul. and that I know precious little of being parched. my life is what others long for when they dream of safety. even in our lifetimes, even now. or keep me from sleep. Do not ever let me forget that waking itself is a privilege. Community that gathers to sing and dance and hear stories that remind us of the strength and solidarity we find together. Community that invites new stories by welcoming and embracing the people who live them. Community of care where we can always find solace in the midst of grief and fear. Community of challenge where we form ourselves so we can transform the world. How do I embrace the holy? How am I called to serve? What am I ready to commit in the service of a better world? What do I value more than I value my own comfort? Where am I willing to take a stand? This is how ministries, and the courage to say Yes, are found. Let us listen to each other so deeply, love each other so boldly, that all of us can learn to listen to our hearts and find our courage. The needs of humanity are vast, so vast that they numb us. We hover so often on the edge of sleep, comforted by dreams of a world of peace where the work of justice, our work, has already been done. We dream of a world with clean flowing waters and clear air where the work of environmental stewardship, our work, has already been done. We dream of a world where civil rights including the right to marry are guaranteed to all our citizens — a world where the work of fighting homophobia and heterosexism and racism, our work, has already been done. We dream of a world where even the girl children can go to school, where no child fears abuse or goes to bed hungry, where each child is loved — a world where the work required to save the generations, our work, has already been done. And we want to stay in that dreamtime, remain at peace just a bit longer. Do not allow us to flinch from the sure knowledge we are being summoned to our life’s work, and must awaken. we are all one family, one tribe. May we be true companions to each other, full of patience and care and compassion, willing to speak and hear each other to courage for the next fifty years, and the next, and the next. And now, fully awake, may we find that the world we call ourselves to create together is so much more than anything any of us ever dared to dream.